WordPress loan calculator plugin for real estate and finance related blogs. 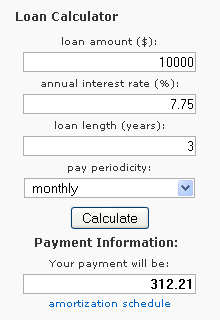 Install this loan calculator widget on your blog now! If you are a personal finance related blog owner, real estate agent or somehow associated with the lending industry, install this WordPress loan calculator plugin on your blog and increase the popularity of your website! Since it is a Java based plugin, your users should enter the desired values into the appropriate fields of the calculator plugin and the result will appear instantly. You are free to use our simple wp loan calculator widget on your website as long as the copyright notice and backlinks are left intact! We have created a Java based WordpPress loan calculator plugin (widget) that can be used by anyone free of charge to extend the functionality of their blog. Our main goal was to keep the design as simple as possible so it should nicely fit in almost all the templates. You can see a screenshot of the installed plugin in action right next to this text. The installation is the same for our widget as for the majority of other WordPress plugins. First of all, you will need to download the loancalculator.zip file from our server and extract its content on your computer. Now you can upload the extracted loancalculator main folder and its content to your blog's plugins directory: /wp-content/plugins/ trough an FTP connection or upload the whole .zip archive file from the Administration Panels. Finally, all you have to do, is to activate the plugin through the Plugins menu in your WordPress based blog and that is all. You are welcome to modify everything on the widget while you leave the copyright notice and backlinks intact.